Dress Date with you in Calgary! If you've been following along on SFP you've likely noticed a few posts featuring dress designer, Eliza J. Whether it's office-appropriate dresses, summer maxi's or wedding dress attire, this versatile brand is always my go-to for fun, flirty dresses. While available at a variety of department stores, Nordstrom boasts the biggest collection of dresses, coats and accessories from the brand. 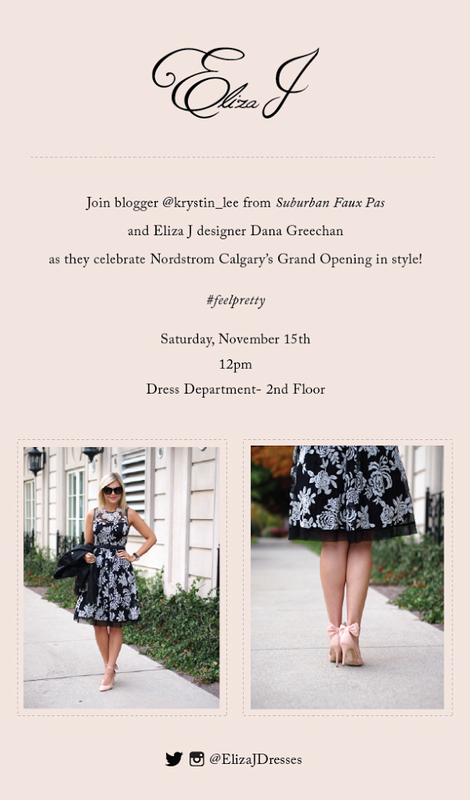 And if you're a fellow Canadian gal reading this post, you know how amazing it is that Nordstrom has FINALLY opened its first store in Calgary, AB. To help celebrate the launch, I have partnered with Eliza J to co-host a dress date afternoon on Saturday, November 15th beginning at 12pm! I'll be in the Dress Department on the 2nd floor ready to do some damage with you! So be sure to book your appointment sooner than later as spots have already begun to be filled! I can't wait to meet, shop and #feelpretty with Nordstrom and Eliza J.
I love that feminine dress paired with the leather jacket! Such a great look! Gorgeous look head to toe! Love the shoes. And that jacket is my fave. Such a stunning look! And I love how you added those sweet heels! So so beautiful! As I said on instagram: I LOVE this outfit! it's exactly the way I would combine it! Cute and cool - love it! Beautiful! ...and that necklace! It's absolutely amazing and would make any outfit look incredible! Gaaaahhh those shoes are incredible! Love this. Love the edge the leather jacket gives! those shoes OMG LOVE! The whole look is so classy and beautiful. I love that you paired this feminine, floral dress with a leather jacket. Great outfit! That dress is fabulous and those heels with the bow detail are just amazing!! Gorgeous! Love how 50s pinup meets motorcycle chic works so well for you! Absolutely gorgeous Krystin. In love with the shoes, just adorable.Beautiful dress and it looks amazing on you.